We’re continuing to delve into the challenges faced by vulnerable customers when dealing with utilities and financial services providers - and we’ve stumbled upon a simple, but brilliant initiative. We’re in no way affiliated with Monzo, but we love experiences that make people’s lives that little bit easier and we think this one deserves some recognition. In our interview with Mark McElvanney at StepChange Debt charity, we heard about the challenges surrounding engagement between financial services companies and customers in need of help. “Even where companies are able to offer real support, they’re just not able to connect with the customer,” Mark said. For some people dealing with financial difficulties, having to discuss their situation with another person can be a difficult proposition. It brings even greater challenges to people dealing with multiple vulnerabilities – like those who also have a speech or hearing impairment. Monzo is of course a digital bank, and so its interactions with customers are geared around digital – largely through its app. But with four out of ten people in the UK regularly using mobile banking apps to access their account, banks would do well to take some inspiration here. Monzo have been working with the Money Advice Trust and the University of Bristol’s Personal Finance Research Centre to develop a tool that lets customers tell them about their circumstances from the Help tab in their Monzo app. It says it can use that knowledge to support customers in a way that suits their needs. They then send the information straight to their Vulnerable Customers team. Monzo says, “Nobody understands the support you need like you do, so we’ll take your lead and listen to what you’d like us to do. 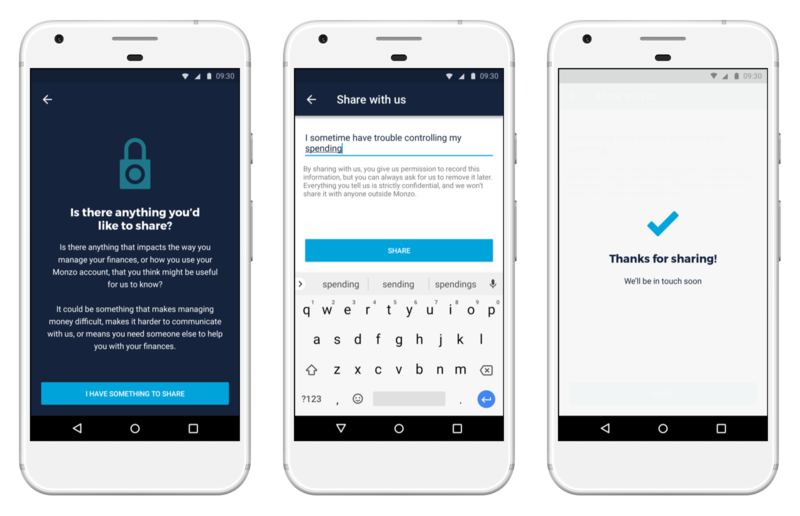 How Monzo says it might help: “We want everyone to be able to use Monzo to manage their money, so if you have a disability or other accessibility needs, you can choose to let us know. How Monzo says it might help: “If you’ve chosen to stop gambling, we can help you block gambling spending from your Monzo account. You can also let us know what extra support you need. How Monzo says it might help: “Changes to your health can have an impact on the way you manage your money. “If something’s affecting your ability to make decisions, we can turn off your overdraft so you don’t get into debt you can’t manage, or add a bit of friction by removing the option to open an overdraft from your app, so you have to speak to customer support before we lend to you. Monzo believes this will help make it a more accessible, responsible product for everyone. It says it will use the feedback, experiences and information that customers share to design new product features (or change existing ones) to help other people in similar situations. Frankly, we think it’s brilliant.